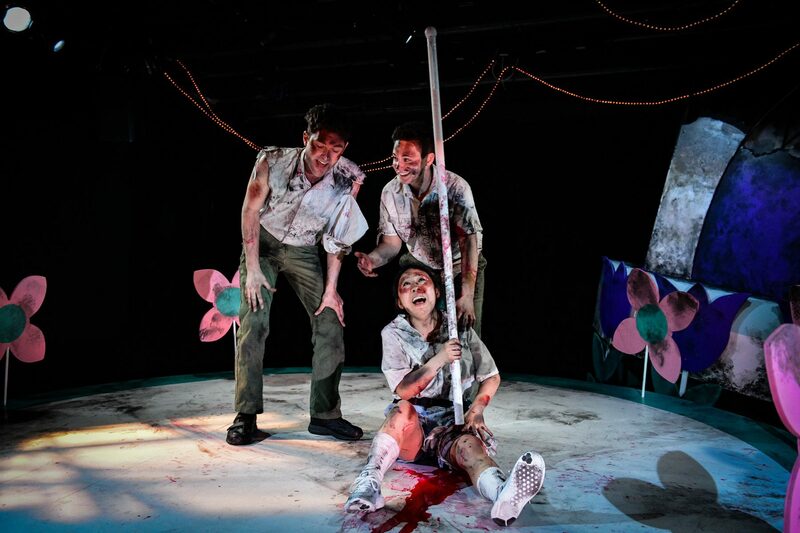 “No one dies at Disney,” Stephanie Shum screeches into the abyss during Small World at The New Colony, a show that may prove to be the funniest and simultaneously most disturbing theatrical event of 2019. When I say funny I do not mean elbow your friend and chuckle a few times in the first thirty minutes before things get serious. Jillian Leff and Joe Lino’s new play Small World made me and my guest guffaw for about 80 solid minutes. This is a refreshing structure, as there is still quite a lot of emotional depth provided by the text and Patriac Coakley, Stephanie Shum and Jackie Seijo, the cast of three that launches this production into the stratosphere of hold-on-to-your-stomach hilarity. Any great acting teacher will tell you that comedy comes from truth. Director Andrew Hobgood’s direction ensured each character felt authentic even inside their bizarre circumstances and the snappy pacing of the show. Small World takes place inside of the Happiest Place on Earth at the beginning of the end of the world. A clever announcement disguised as the protocol for the ride upon which the audience is about to embark begins the play, seamlessly blending our experience with the one onstage. Sotirios Livaditis’ carefully broken down and bombed out set manages to imply Small World and its cleverness is actually in implying what we don’t see – the mounds of puppets preventing the walls from crashing down around our precious cast. The director, actors, and design team collaborate to take this world premiere of Small World to the next level. It takes place shortly after a catastrophe in the broken down “it’s a small world,” ride at Disneyland and the music reverberates throughout the play, whether playing over the audio or being scream-sung by Shum. There is no water onstage, yet we know the actors are surrounded by the famous moat due to Erik Siegling’s nuanced sound design. Every time an actor jumps into the “moat” we hear the sound of them walking through water. Small theatrical magic like this is what makes storefront theatre in Chicago so satisfying to watch. Throughout the play there are various questions of worship, mortality and morality that surface as they do at the end of days. Kim (Stephanie Shum) characterizes the false idol worship that Disneyland demands, consistently trying to cheer up her fellow co-workers, and maintaining the Disneyland protocol that no actor plays a character they are simply a “friend of Cinderella.” Kim often cites “the power of positivity” as the best way to stay alive, and relies on screaming her favorite Disney songs and trying to connect with her co-workers to stay calm. Shum does some really intense physical work in this role, and her comedic tendencies have found a place to shine here. Donny (Patraic Coakley), the friendly Florida Man and seemingly normal employee, turns out to be a survivalist and that one friend who thinks a crisis is their moment to shine, but has a questionable skill set when it comes to taking action. Becca (Jackie Seijo) is the only Disney employee not drinking the Kool-Aid, and is given the richest backstory. Becca also happens to be the only queer character onstage. I phrase it that way because it only comes up a handful of times, but being a queer writer myself I couldn’t help but focus on her character. At the beginning of the play Donny says to Becca “you have the makings of a fine wife,” to which Becca, who I am 90% certain is a lesbian but 100% certainly not into Donny, understandably responds with an expletive. I couldn’t help thinking that, even at the end of the world, straights gonna straight. This world premiere is a bold step forward for The New Colony under the leadership of co-artistic directors Stephanie Shum and Fin Coe. Small World is a wild ride through the capitalist forest of false gods, survival skills, unrequited love, and a helluva lot of blood gags. In the last sobering minutes of the play, ribs still aching from laughter, I knew I would want to talk to all my friends about this piece as soon as I left the space. Small World is produced by The New Colony and runs at The Den Theatre through May 4th.